Applications are invited from suitably qualified candidates for admission into the under-listed programmes (full-time, part-time and weekend) in the School of Postgraduate Studies, Alex Ekwueme Federal Univesity, Ndufu-Alike Ikwo (AE-FUNAI), Abakaliki, Ebonyi State, for the 2018/2019 academic session. FUNAI Postgraduate Programmes & Duration. 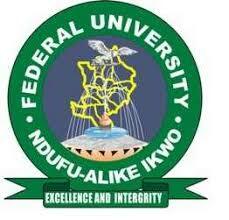 How to Apply for FUNAI Postgraduate Admission. On payment of non-refundable Application Form fee of fifteen thousand naira (N15,000.00) only, made payable to “Alex Ekwueme Federal University, Ndufu Alike, Ebonyi State” at any Commercial Bank within the Country using the Remita platform, candidates can download and complete the online Application Form by logging on to www.funai.edu.ng. Candidates should also download the online Referee report forms and submit to their Referees (three Referees) one of who should be their former Head of Department. The Referee report forms after being filled-in by the Referees should be received back in sealed envelopes (addressed to The Secretary, School of Postgraduate Studies, Alex Ekwueme Federal University, Ndufu Alike, Ebonyi State) by the candidates and enclosed alongside other documents in the application package. Kindly note that applications are not complete and would not be processed unless the Referee reports are available. CLOSING DATE: Sale of online Application Forms will close two months from the date of publication of this advert i.e. 2nd October to midnight, 30th November, 2018. IMPORTANT NOTE: All applicants shall undergo computer-based postgraduate admission screening test, date of which will be communicated to all applicants via sms. REGISTRATION: Successful candidates are expected to register their postgraduate courses immediately after they are offered admission at the commencement of the session.